Kim Lord's practice focuses on real estate transactions, including purchase and sale, leasing, construction, formation of common interest communities and the land use approval process. Kim also represents clients in general business matters, including entity formation, contract preparation, acquisitions and sales and employment issues. Kim has practiced law in Colorado since 1989 and over the years has represented numerous developers, contractors, architects, landlords, tenants, homeowner associations, brokers, property owners and business owners. Kim moved to Boulder in 1981 to attend undergraduate school at the University of Colorado and has never left. She obtained her undergraduate degree from CU in 1985 and then graduated with honors from the University of Colorado School of Law in 1989. Following law school, Kim practiced with the national law firm of Morrison & Foerster for five years and then for six years with the Denver law firm of Silver & DeBoskey. Prior to joining PackardDierking, Kim was a partner with the Boulder law firm of Johnson & Repucci with an emphasis in real estate litigation and real estate transactions. Kim was recognized for several years as a Colorado SuperLawyer in Business Litigation and as the Individual of the Year by the Colorado Lawyer's Committee for pro bono work. Kim currently serves on the Board of Directors of Colorado Legal Services. Kim is a past president of the Colorado Lawyers Trust Account Foundation (COLTAF) and served for several years on the Colorado Women's Bar Association Board. 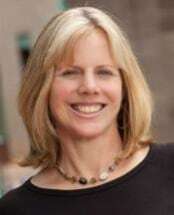 She is also a past Chair of the Boulder Bar Association Real Estate Committee. Kim lives in Boulder with her husband, young daughter and two dogs. Kim loves running with her dogs and skiing, hiking and biking with her family and friends. Kim also teaches and practices both Pilates and Yoga.